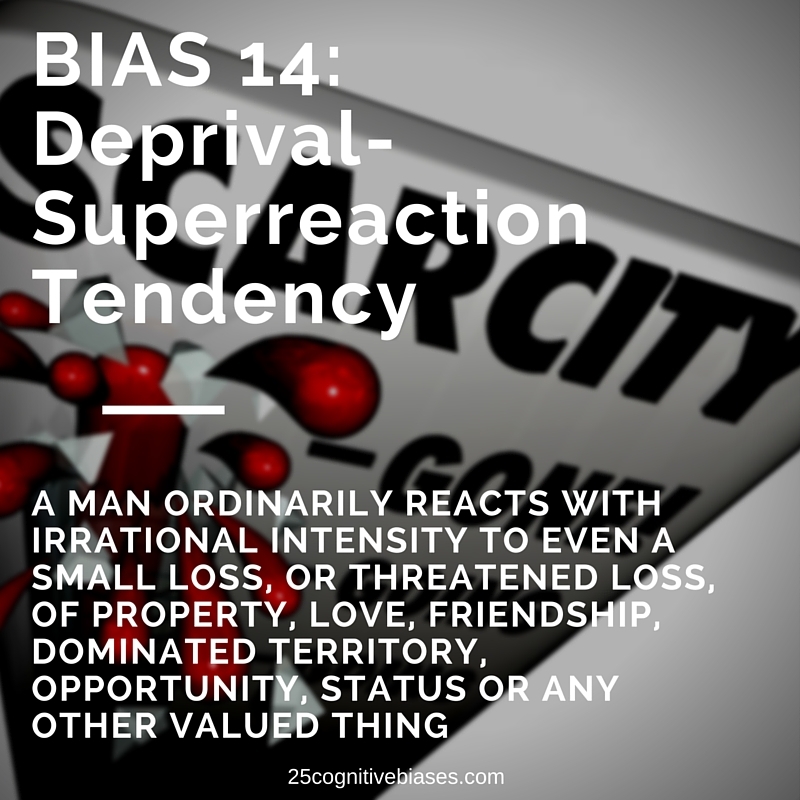 Bias 14 - Deprival-Superreaction Tendency | 25 Cognitive Biases - "The Psychology of Human Misjudgment"
This entry was posted in 25 Cognitive Biases, Bias 14 - Deprival-Superreaction Tendency and tagged Charlie Munger, Cognitive Bias, Deprival-Superreaction Tendency. Basically lets say you get payed $50k a year and you get a raise of $50k. You’re now making $100k a year and you feel GREAT! Now lets take a different approach. You make $100k a year and because of issues with your company, you now only get $75k a year and you feel F****** PISSED!!! Many studies suggest that losses are twice as powerful, psychologically, as gains. A little better way of saying is this. You invest $40,000 and by the end of the year it’s worth $60,000. You feel great but it doesn’t impact your feeling or behaviors significantly. Now say that you have an investment that started out with an evaluation of $60,000 but it’s only worth $50,000 by the end of the year. You could become irrational, depressed, reactive , bitter and overwhelmed by this. This smaller loss will have a much greater impact than the larger gain.